Did you know that in DC and Maryland you have the power to choose your electric supplier? We're proud to partner with Go Good, whose mission is to accelerate the transition to a clean energy future. At any of our locations, you can receive information on how to make the switch to clean energy. When you sign up, you receive a $35 gift card to Yes! Organic Market. Sign up today! 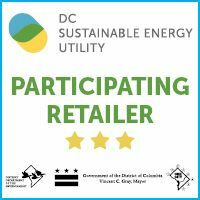 Through our partnership with DCSEU, the DC Sustainable Energy Utility, we are able to offer energy-efficient light bulbs to our customers at a fraction of the retail price. Our DC stores all carry long lasting, energy-efficient CFL and LED lightbulbs. In one year alone, Yes! Organic Market customers have saved 182,400 kWh. That much energy is the equivalent of preventing 288,192 pounds of CO2 emissions, equivalent to taking 26.3 cars off the road, or equivalent to powering 15.2 homes for a year! Please note the subsidized light bulbs from DCSEU are not available at our Hyattsville, MD location.